The show kicked off promptly as scheduled at 7:30 PM with special guest Tyga. Dressed in an Off White by Virgil Abloh jacket and customized Timbs, T-Raww came out the gate with his venomous track “Make It Work,” taking shots at Drake. The crowd, which had filled in by then, went wild as Mr. Steal Your Girl seamlessly belted out old and new selections from his catalog. But just when the ladies thought it was time for another serenade, Ty Dolla $ign hit the stage to assist Trey on “Dead Wrong” followed by his own “Paranoid” remix. Sticking to the script, 9PM was the moment everyone had been waiting for when Chris Brown took the stage. As anticipated, Breezy was ready to dance. His back-up dancers in tow, the singer entertained the crowd with gyrating pelvic thrusts and grinded to “Wall to Wall,” “Run It,” “Deuces” and “Poppin,” among others. With the energy on high, Chris warned that he too had something in store for his fans. With that message, he welcomed his “big brother” 50 Cent and G-Unit to the stage for a random but great addition to the New York leg of the tour. 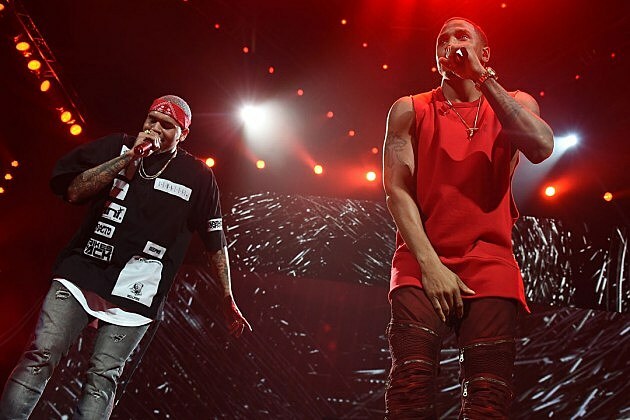 Fif and his crew rocked out to the classics “Many Men” and “What Up Gangsta.” With 30 minutes left until the show would end, Tyga returned and he and Breezy shut it down with “Ayo,” off their forthcoming Fan of a Fan album. Of course the night couldn’t end without Breezy closing out with one of his biggest hits to date, “Loyal.” The tour, which was revised due to the crooner’s community service mandate, continues on Wednesday (Feb. 17) in Baltimore at the Royal Farms Arena.